Best professionally sharpened knives, scissors and tools. Custom made knives. 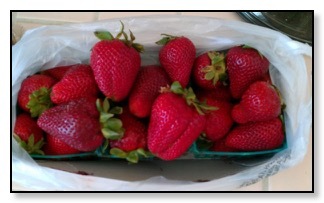 Serving Restaurants, Homes, Medical & Vet Offices on the Westside of L.A. Mobile service & drop-off available. Laurence Segal, Westside Mobile Knife Sharpening, is licensed and fully insured to work outside of your home or office. All work is done on site at my truck. 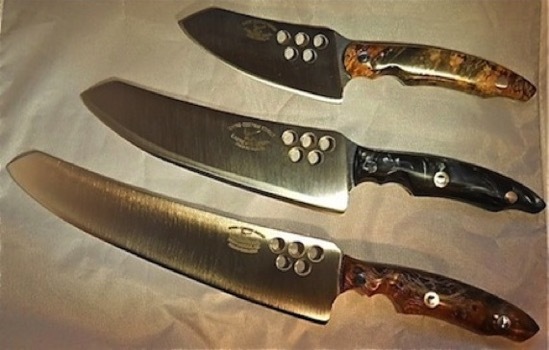 Laurence Segal, master knife maker, sharpens all culinary and sport knives, including Japanese knives and serrated knives, scissors, and most garden tools. between San Vicente and Montana Ave.
Westside Mobile Knife Sharpening's booth is towards the south end of the market by Montana Ave.
Bring your knives to the market and Laurence will sharpen them while you have lunch or shop. Yes, we can sharpen you scissors. Yes, we can sharpen your serrated knives as well. Westside Mobile Knife Sharpening can sharpen your garden tools, including hand pruners, branch loppers, hedge trimmers, axe heads, hatchets, and more. Laurence Segal, a master craftsman of custom knives, also sharpens culinary knives, scissors, and some garden tools in Santa Monica, CA and surrounding communities - his service is called Westside Mobile Knife Sharpening. Laurence's customers rave about the excellent sharpening he does, his reasonable prices, and prompt service on Yelp® and other review sites. The man knows his stuff and is very reasonable . . .
5.0 star rating - Yelp - Amazing! Brought in two knives that had been sharpened by other places, but they couldn't restore the original sharpness. Laurence did. My knives are like new and he did it while I waited. The man knows his stuff and is very reasonable. What a find. 1/11/2012, Gary L., Santa Monica, CA.
. . . Laurence did the best job of anyone . . .
5.0 star rating - Yelp - As someone who spends most of their life in the kitchen, I have a lot of expensive knives. New to Santa Monica, I needed a new cutler to sharpen them. I found Laurence here on Yelp, read all of these glowing reviews, and confidently brought him two of my high-end santoku knives, and about six vintage Case Bros. pocketknives (my own, plus five others that I was giving away as Christmas presents). I have been to a lot of cutlers over the years, but Laurence did the best job of anyone so far. I brought him dulled knives, and when I got them back they were Weapons of Mass Destruction. As a true craftsman would, Laurence even polished up the nickel silver bolsters on the vintage Case pocketknives, so they looked new again. His prices are in line with all of the other cutlers in the area, his service is fast and friendly, and your knives are treated with the utmost care. As long as I live in West L.A., Laurence is my guy. Bring your valuable steel to him with confidence. 1/27/2014, Max G, Santa Monica, CA. Contact Laurence either by phone at 310-395-3075 or by email, info@westsidesharpening.com. Laurence responds promptly and stands ready to give you excellent, professional knife, scissors, and tool sharpening service. The owner does sharpen knives for a ton of local chefs . . .
5.0 star rating - Yelp - . . . I now get my chef's knife and paring knife sharpened at least once a year. If you have bought an expensive set of knives over the years like I have, a place to go to and have your set properly taken care of is huge. The owner does sharpen knives for a ton of local chefs. Solid. 1/27/2014, Mitchell I., Scottsdale, AZ. Our old knives were sharpened to perfection - and he does it at very reasonable prices. 5.0 star rating - Yelp - . . . Our old knives were sharpened to perfection - I've sharpened knifes myself at home and no way could I have duplicated his result - and he does it at very reasonable prices. Would definitely return, and recommend this place to others. 5/29/2013, Heidi N., Santa Monica, CA. Westside Mobile Knife Sharpening for All Your Knives, Plus . . .
Laurence Segal, master knife maker, sharpens all culinary knives, including Japanese knives, scissors, and some garden tools. Any German or American knife up to a 6 inch blade is $7.00. Any inch of steel after that is one more dollar. So a 7" knife is $8.00; an 8" Knife is $9.00 etc. . ..
Japanese knives are $9.00 for the first 6" with a $1.50 a inch after that. So a 8" Shun or Global is $12.00. Scissors, From $6.00 to $20.00, for scissors from kitchen scissors to Japanese hair shears. I can restore tweezers as well. $10.00 each. I have a 100% happiness Guarantee! Please call if you have questions (310) 395-3075. Westside Mobile Knife Sharpening happily accepts sharpening orders by mail, sharpens what you need sharpened professionally and promptly packages and returns the newly sharpened knives, etc. The following address is a mailing address, NOT a physical address to which you can personally drop off knives.